Thanks to Lauren for this Frugal Baby Tip! Sherry asked: I bought some fleece at Wal-mart to make some covers and liners out of. Anyone have suggestions for the length and width for the liners? I also need to find a simple, preferably free pattern for a pull on fleece cover. Lauren answered: Your fleece is good to go as long as it is 100% polyester polar-type fleece. One of the names it is sold under at Walmart is Calgary, but there are others too, I think. I made my pattern from scratch, but if you want to make a pull-on pant you could use an old pull-on nylon or vinyl pant (or even buy a cheapo Gerber vinyl pant), and cut it open for the pattern. Your seams will be at the sides going vertically, kwim? Add extra fleece at the waist and legs for the casing. edge of the fleece over, making 1/2 inch of space or so for the elastic, and sewing the fleece to itself. Leave a space, then thread the elastic through, sew it together, then sew up the space you left. 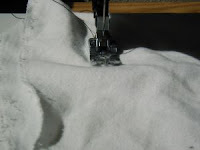 You do not need to finish fleece, it won't ravel, so raw edges are fine. I use 100% polyester thread. For sizes of liners, just make them whatever size/shape will fit comfortably in the diaper. You don't even need to sew the edges, just cut and go!